Originally brewed as a Christmas beer in 1948, this dark ale has rich flavors of mulling spices and caramel, with a smooth palate and warming finish. Oct 2003 i was lucky enough to sample a bottle of 1991 and a bottle of 1981 Chimay Blue from, where else, the Kulminator. My score represents the 1981 version. The 1991 bottle poured just like a current bottle would minus the head of course. Alot of woody notes in the nose as well as the fruitiness of cherries and raisin with a pinch of spice. While there were many of Chimay's "beer" qualities in this bottle, you knew you were drinking something aged for 12 yrs. The beer as a whole was much more mellow and smooth...refined might be a good word. Still an excellent beer. The 1981 version on the other hand was much different then a current bottle of Chimay. And what can expect after being cellared for 22 yrs? Much like the 1991 version there was plenty of grape, cherry and raisin in the nose, except this time there weren't "hints". This time everything was much more pronounced. The aromas and flavours jumped out at you. Grape & cherry sweetness. An oaky woddiness. A toned down spiciness. Exceptional smoothness. You could really tell the difference and make no mistake between the 1991 & the 1981. The finsh lingered nicely but almost faded a little too quick. It left me always wanting more. While this beer taste less and less like a "beer" the more it was aged, it was still exciting to see how a beer can change in complexity and become a more refined drink. By refined i mean, smooth, complex & unique. A fabulous drinking experience. Worth every penny. I tasted this right after the Premier for comparison purposes. Appearance  Dark, rich brown color with a full, lacing head. The cloudy hue that comes out of this bottle makes your mouth water. Smell  Opened up to a nice, fruity malt aroma and a brief ABV warning. Taste  To my tastes, this is exactly what a Belgium Strong Dark Ale should be. The classic tobacco flavor compliments the huge malt and yeast. It all plays exceptionally well over the tongue. Of all the flavors to be found here, I enjoyed most the current, caramel, and dark toffee blend that seemed to kick in at the end, especially as the beer sat. Mouthfeel  The conservative carbonation was suitable for the style. However, the foamy up front feeling was not to my liking. Drinkability  This has to be one of the smoothest, easily-drinkable 9.0 ABV on the market. Again, the fizzy front end slowed things down a bit, but once I picked up the body is was quite drinkable. Comments  I hate to go overboard on a brand available in half of Americas grocery stores (at least here in Seattle it is), but this beer is terrific. If I had the money, I would sip this every time I tasted another Belgium. IMHO, this is the standard by which all others must be judged. Update: The 2004 vintage is more of the same. I havent been able to get a consistant 5 head over time so Im dropping this rating to a 4.5. Chimay is the reason I drink craft beer. I was turned on to chimay about 20 years ago and it was very hard to find a beer as good until the last few years when craft beer has really become popular. The Grand Reserve has a bold strong flavor that keeps you coming back for more. It has a strong malt smell and pours dark with a good head. Their are many great beers around today but not many have been brewing as long as Chimay. I wanted to try this beer because it is so highly rated! Well it is not the type that i would normally go for but I must say this is a good beer. The fact that I like it and it is not a type I usually like says a lot! Nice lookiing dark amber with nice head. Wonderful spicy flavor with strong but not overpowering or alcohol taste! This would be a great winter warmer beer!!! Lots of alcohol but very drinkable with good mouth feel. I like this! And will drink it again on a cold snowy night. WATCH out this is very drinkable but STRONG! Be warned :) What a great beer just perfect for cold nights. MUST BE DRANK AT THE CORRECT TEMPERATURE and the older the better! :) Also drink from the proper glass! An incredible beer that has become one of my all time favorites. After drinking this (and the other Chimay's) all my other beer reviews seem like straw! This is an incredible beer that blows away everything else I have ever tried. Probably the best Trappist/Belgian strong dark ale and overall the best beer I ever tasted. I only recently came to that conclusion. 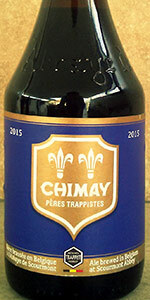 Chimay blue is one of the 1st Trappist, stong beers I tried in my life. At that time, I was 17 years old, I liked beer, no matter what type and to me Chimay blue tasted just like a trappist, I couldn't exactly tell a difference with a Westmalle dubbel. Later I came to appreciate the differences, but to me Chimay still was just a trappist you could buy everywhere. Beers like Rochefort or St. Bernardus weren't readily available and just how it works in the mind, unknown, more rare beers always taste better. I have dismissed Chimay the last two decades, always chose Rochefort, St. Bernardus, La Trappe and recently Jopen Ongelovige Thomas over the blue labeled bottle. But Chimay blue beats all of them in my opinion. And for the biggest part because it leaves no strong sweet aftertaste. The aftertaste isn't exactly dry, but it doesn't stick too long. All the other trappist/abbey beers to a certain extent blurr or flatten the taste after a while. The best example is the Rochefort 8, the sweet aftertaste ruins the experience to me. Chimay has the ideal balance between sweet and bitter. It is smooth (non-boozy) like a Rochefort 10 and spicy like a St. Bernardus, and the amount of carbonation is spot on. True the sweetness isn't that round and smooth like a Rochefort 10, it is more stingy (for lack of a better word) but it leaves with little trace, therefore every new sip tastes great, not muted. Do note: with this beer it really is important to serve it at a minimum temperature of 10 degrees Celcius, not any colder, because when served too cold the taste is watery and muted. I usually drink this beer at (slightly lower) room temperature, 17 up to 19 degrees Celcius works great for me. Review taken from notes Spring 2014. I've jotted down notes on more than 7 occasions with this brew. 750 ml brown Chimay trapping style bottle. Corked and capped in typical Chimay style. Label is blue in color featuring many great Belgian trappist monk artwork I have no less than loved from the beginning of kt craft beer days. Poured into an authentic Chimay trappist goblet. A - massive head on the pour which displays a very unique tan color which you'll only find on authentic trappist dark ales. It settles after what seems like forever and leaves a thick ring of lacing leaving incredible like stick. Body color is trappist brown with hints of the brown side of dark, mahogany ruby gleaming through when held to the light. Yeast sediment and particles are at full force and only add to the experience. S - doughy bread like yeast with a buttery sweet caramel note that's simply a trademark of Chimay. A nice semi hoppy note of orange peel and a faint whiff of ripe apple. The more Chimay Blue warms dark fruit really sets within the nose. A mild whiff of alcohol and spice in the background. A simple yet pleasing trappist aroma. T - the flavor really takes on the simplicity of the nose and hammers home great monk style taste. Sticky, sweet, buttery caramel let off a near candy corn note within the mouth. Doughy Chimay style yeast with big dark fruit flavor. A soft candied orange note creeps up followed by a mild alcohol and spice finish. Delightful flavor. M - upper medium in body. Displays spot on thickness as intended in this monk brewed ales. Just a perfection of a body for the style. A semi dry spiciness in the finish. Mild alcohol warming that adds even more depth and complexion to the mouthfeel. O - Chimay Grand Reserve or Chimay (Blue) as most refer to it as, is a simple yet world class Belgian Strong Dark ale and really the perfect option to begin with exploring bigger Trappist ales. It's been a real favorite of mine since our first encounter, and one I'll grab on a few more than special occasions every year. Just a classy ale from a classy brewery. Chimay offering are all world class, but the blue is their way of showing you how talented and perfected a beer recipe can be. Hazy dark brown, almost black, with lighter brown highlights. Topped by a creamy off white head with great retention and streaky lacing. Smells dried sweet cherry, plum, fig, date, brown sugar, honey, toffee, toast, caramel, and hay. Rich, sweet, and spicy. Tastes of dried sweet cherry, plum, fig, date, raisin, brown sugar, honey, molasses, toffee, toasted brown bread, ginger, and hay. Fairly sweet and caramelized throughout, with a moderately spicy and lightly dry finish. Creamy and pillowy, medium-plus mouthfeel with effervescent carbonation. A fantastic Belgian ale! One of my favorites. Look - Murky/muddy dark brown color. Overall - Up there with Rochefort 8 as my favorite Belgian. Delicious!!! Great beer, a classic strong dark ale. So I'm nota huge fan of Belgian strong darks, more of a Belgian pale guy so take this with a grain of salt. This is definitely a good beer and top of the style in my opinion. Pours a deep brown color with a rich creamy head. Smells of fig and raisin bread. Taste of dark fruits, prunes, arisen and a bit of oak and port wine. Medium to heavy mouthfeel, juicy and a bit creamy. L - red-brown beer, with a ruby glow when held against the light. Big hazelnut head. I almost didn't want to drink it. S & T - raisins, slight candi sugar, milk chocolate on the back-end, toasty maltiness. Rum-raisin chocolate bonbons. F - nice and creamy, so so smooth. O - Take your time when drinking this. The tastes evolve and you discover more and more as you sip it over half an hour. It was quite the experience, and I'm not even that big a fan of the Belgians. I do recommend this one. S - lots of yeast both bready and Belgium notes, floral hops, fruity hops, lots of sweet malts, sweet and dry grain, sweet booze note, oak, dead and living earth, crisp water and Caramelized bananas. D/O - really easy to drink with lots of flavor. Huge malt with a slight hop all while being very refreshing and pleasant to drink. Cracked one open on a cool humid night and is/was perfection. Pairs well with most foods and desserts but it pairs the best with itself (meaning opening more than one in a night). Great any day, any time of year and as often as you'd like to enjoy one. The Blue is a beer best served with a good food accompaniment. I had mine with a burger with Chimay cheese on it - it was an absolutely fantastic pairing. poured this into a snifer and it gave me lots of head that some spilled. the color is a dark amber and the head is a nice beige color. it has nice lacing and the smells is of dark fruits like plums, figs, and raisins. the taste is delicious and smooth. you can taste figs, dates and hint of nuts. overall this is very tasty and I am going to cellar one for a couple for a couple of years to see how it changes. 750 ml bottle into a tulip snifter. Had 1/13/17. Pours a dark brown, a little garnet on the edges in the light, fairly opaque, with a huge three inch foamy head on an average pour. Lots of foamy lacing. The smell is Belgian yeast, candi sugar, caramel, dates, figs, malt, some spices- cloves, for one. Light black pepper in the head, a little cola aroma. The taste is also strong on the yeast, much more malt than the nose, caramel, figs, candi sugar, dates. A quick flash of light bitterness up front. Smooth, creamy, a solid, medium body, well carbonated- a little on the high side. A classic and top notch Belgian Strong Dark, with well blended flavors and a big, complex aroma. This is a beer everyone should try. I drank Chimay Grande Reserve from my 1 liter Disneyland cup. It is funny that is calledd Blue when in smaller bottles. It is a treat but I had many times before. Taste: The taste is sweet raisin bread, figs, banana, maybe some yeast, it is a bit boozy, but very good. This is a very unique beer. It has a light, effervescent mouth feel while expressing dark, malty, spicy, stewed fruit flavours and aromas. A touch sour and herbaceous on the finish which adds complexity. Poured into a Chimay goblet. Look was a deep reddish brown, with a large head that hung around for quite a while. Smell was of malt and spice. Taste was again spicy, a little bitter, but great complex flavors. Feel was silky smooth, good carbonation, easy drinking for 9% ABV. Overall, a great dark ale true to the Trappist traditions, and so very enjoyable. and invigorating, lively carbonation, subtle dryness on the aftertaste.....awesome. to enjoy fantastic craft that is available in wide distribution. Their cheeses are fantastic as well by the way. Poured from the magnum bottle into a schooner glass. A moderate pour produces a creamy tan head of about an inch. The beer is a hazy yellowish-brown of moderate depth. The aroma is bready, earthy, fruity and minerally. The flavor has a distinct maltiness, suggesting a gingerbread cookie. Also apparent is a spicy apple-raisin fruitiness, and a lemony tartness on the finish. A peppery bit of spice and pucker punctuate the flavor, while a light earthy funk underlies it all. A little boozy warming is apparent, and perhaps a touch of spicy alcohol bite. Vinous, port-like notes and dark fruit hints become more pronounced as the beer warms. The mouthfeel is frothier than one might expect. This is obviously a world class beer worthy of its reputation. I'm on a bit of a Belgian kick at the moment (this style becoming more available in my area), and am enjoying this and other Belgian beers very much this Thanksgiving weekend. Thankfully, the blue is more widely available in the U.S. than most any other quad or strong dark Belgian ale. When I enter a restaurant and request the beer list and see this blue is available, I sigh with relief. There certainly are better quads or strong dark Belgian ales, but I always enjoy this classic. S: Malty scent with fermentation with an unique spice scent. A great scent of bakery was also notices. Slightly hoppy. T: Sweet, light syrup taste. Premium malty flavor. Balanced taste. Creamy feeling in mouth. Excellent. F: Balanced with rich body. O: Smooth, sweet finish. A bit stronger and sweeter than Chimay Premiere. Great Abbey bier, great buy. In the US, pilsner and india pale ale overwhelmingly dominate the market, but it feels good to go back to the basics and the fundamentals. Abbey bier for life. Honestly one of the best overall beers I have ever enjoyed. Very pleasant sweet and spiced maltiness with virtually no bitterness. The smell is of spice and reminds you of holiday cookies. The deep bronze color and ample off white head signal you that you're in for a treat.